Many of us over the Lenten season are deeply involved in prayer, fasting, and almsgiving – the traditional manner of immersing ourselves in a season that calls for transformation and conversation. Many of us are also “Digital Immigrants” in a world that is rapidly moving into electronic communication and global sharing. Perhaps this is the season where we need to begin to imagine what it takes to transform our personal mindsets that keep us in the “Digital Immigrant” Zone into mindsets that allow us to become “Digital Natives” in ways we have never imagined. Perhaps this is the season to challenge ourselves to transform the mindsets that we bring to the Digital Table. How do we do that? By prayerfully considering how we could use the digital tools that surround us to bring the faith alive with our Digital Natives. So instead of turning to the “tried and true” materials we have used for generations – the textbook, the diocesan newsletters we receive, and other materials – that are electronic, but really they are just traditional materials that are now in a NEW format – an electronic format! What possibility do I see here for using in my classroom (or group) for faith development? If I search using the term “Lent” what will I find? Once I find something interesting and maybe even exciting? How can I weave it into my class? How could I share this video? this photo? with those in my class or group? What can I do with Facebook? What can I do with any of the tools that I become familiar with to share the faith? Yes, there are several options for photo sharing. Which one you will use, is your decision. Adam Pash on his blog, shares what he feels are the 5 Best Photo sharing websites. Check out what he says about each. In this case I just did a search using the word “Jerusalem”! Wow all these photo’s that come directly from the Holy City of Jerusalem, created by folks like you and me. My next question – What can I do with these beautiful photo’s? As I looked at my screen, in the upper right hand corner I saw the words “Slideshow” and I wondered “What happens when I click on slideshow?” To my wonderful surprise, without copying, downloading, or whatever – there was this wonderful slideshow of beautiful images about Jerusalem. I could tweet the link – http://www.flickr.com/search/show/?q=Jerusalem to my students or in the bit.ly format – http://bit.ly/gsF0ET With a phrase like “Come Visit Jerusalem in Lent – http://bit.ly/gsF0ET or “Where is Jesus in Jerusalem? – http://bit.ly/gsF0ET ” Then when we met in our classroom, I could ask how their visit to Jerusalem went? What did they see? What questions did they have? What questions would you use? 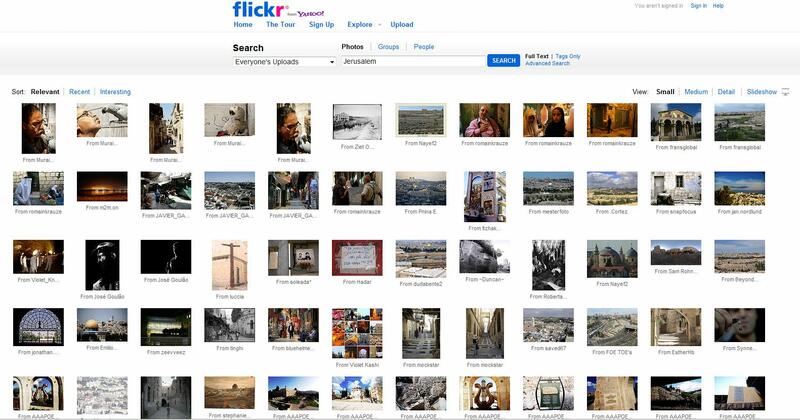 I could teach the students about Creative Commons Copyright and then invite them to create a 30-second video about Jerusalem using photo’s that they have found on Flickr. Animoto is a wonderful website for this type of activity. Sponsor a Church Scavenger Hunt. Give your students a list of items they are to locate in your parish church or your diocesan cathedral. Invite them to photograph these items. Then they could create a PowerPoint using these items and offer explanations of what they have photographed. The PowerPoints can be shared in class or added to your class website or who knows where your imagination will lead you. Our imaginations are limitless! I would encourage you, if you are not already using a photo sharing website, to choose one of these tools. Then to begin to imagine how you can creatively use this tool for faith-sharing. My imagination runs wild, when I begin to use it. What about yours? Of course, what’s most important in becoming a Digital Native, is that you WANT to share your wonderful idea with others. We can all learn from one another! What is your imagination creating? Hope you take a moment to share your thoughts and ideas here at a CyberPilgrim blog! I’d love to hear from you! Thanks, Caroline! Since I am headed to Jerusalem I loved these pictures. Yes, you are right on with Flickr! What a great resource for teachers! I should think about posting some of my travel pictures there. I never did. First, I simply do not have the time but I will put that on my summer ‘to do list’. What do you think? Yes time is always an issue for many of us. Try to post a few photos that you really like. Have a wonderful visit to Jerusalem! Caroline. I like the wildness of your imagination. It does get my juices flowing, as it did when you gave me the nerve to get started in this cyberbusiness in the first place. Frank, I’m delighted that I’m getting your juices flowing. Will look forward to hearing about your creativity with this cyber stuff! Thank’s for this reflection. The Spirit is working in those mysterious ways again! I am currently in early stages of planning a capstone project for an MLA program. I want to use technology–my proposal (I won’t bore anyone with it now) depends on interaction with the audience–a thesis paper just won’t cut it. I’ve got to take that leap of faith and “play” with the technology to find a way to give shape to this project. Kathy – blessings as you jump into this project! Yes the leap of faith and “play” are key components right now. Go for it! You have wonderful ideas and suggestions. I am working with adults (read mature adults) who are reluctant to stretch their faith-sharing to include a blog. It is such a slow process! Part of the problem may be the need to register and use a password to utilize sites like Blogger. Hi Paula, Many mature adults have concerns and fears – and rightfully so! Just as we have been taught to cross a street safely, now we need to learn how to communicate in an online environment safely. Walk them through simple safe ways to share in an online environment. For me it seems the more an adult becomes a Digital Native, the more comfortable one becomes in sharing in an online environment. A thought about “password” protected sites – evangelization is a process of sharing our faith with others. Sometimes this is best done in an “open” blog and sometimes in a “private” blog space. Perhaps this is also an area that needs to be explored with your group. Sometimes the “open” group is a way to attract others to your faith, your parish, your ministry. Hi Paula, For me it seems the more an adult becomes a Digital Native, the more comfortable one becomes in sharing in an online environment. Many mature adults have concerns and fears – and rightfully so! Just as we have been taught to cross a street safely, now we need to learn how to communicate in an online environment safely. Walk them through simple safe ways to share in an online environment. This is how I am going to use technology this lent. I decided to do an enhanced version of “Silhouette Stations of the Cross”. First I went on-line and found stations that were done in silhouette and downloaded pictures of each station…that will help me show the kids how to pose for each station. Now here is the fun part…for each station I also went on-line and found pictures that would be a reflection of each station in ‘today’s world’. After finding about 5-10 pictures for each station, I used Windows Movie Maker and using the pictures and some instrumental music, I made a 30-40 second ‘movie’ reflection for each station. So, now what we are going to do for the parish… is first show the station in silhouette while reading a short description of what the station is…then turn off the silhouette (from the back of the screen) and then I will project the short ‘movie’ using the contemporary pictures and read a very short reflection of what the station means to us today. We will do this for each station…wish me luck…I hope it works! NEXT I would like to take pictures of our event and then make a movie using pictures that I take of each silhouette station along with the ‘movie reflections’ that I make. I can put them all together adding captions. Then I will put the final movie on our parish website for all to see. Maybe even Youtube. Cheryl, I love your creativity! Looking forward to hearing how this went for you and your parish!